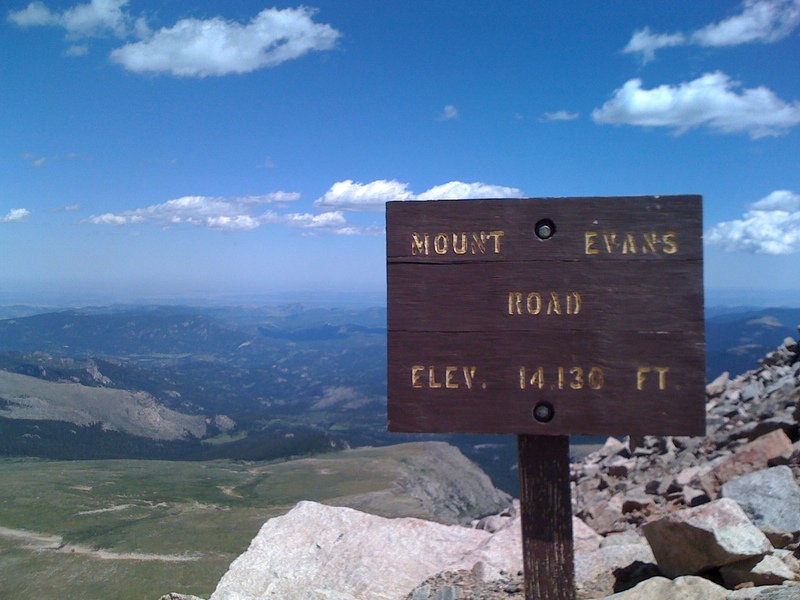 When I moved to Colorado a couple of years ago I had heard that people ride their bikes to the top of Mount Evans, but I for one was totally not interested. 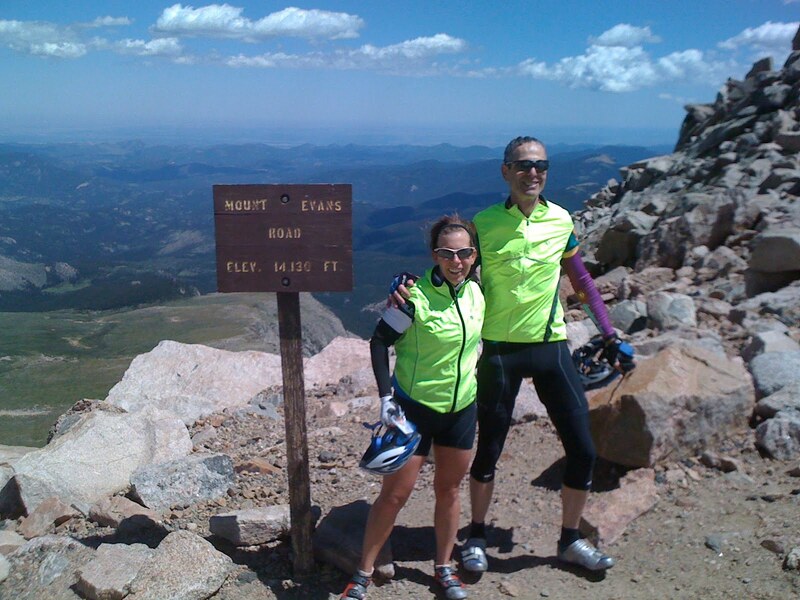 The ride starts at about 7600′ and ends at 14,130′. No thanks, this flatlander was having trouble going up the stairs at 5430′. 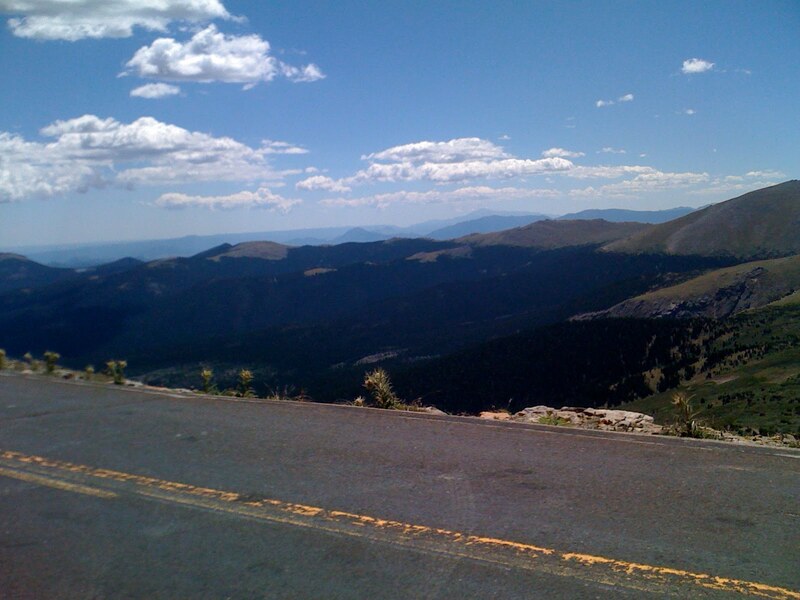 Also, I had heard parts of the road on Mount Evans were very “exposed.” I wasn’t sure what that meant but it didn’t sound like something I wanted to experience. I had done a lot of hill climbing thank you, I would be happy to do plenty more, but it would not need to be higher than the treeline. Recently, my friend Alan started making plans for his visit to Boulder… I imagined all fun things we could do together! And by “fun things,” I mean bike rides! Alan after all was the one who introduced me to the epic climb. 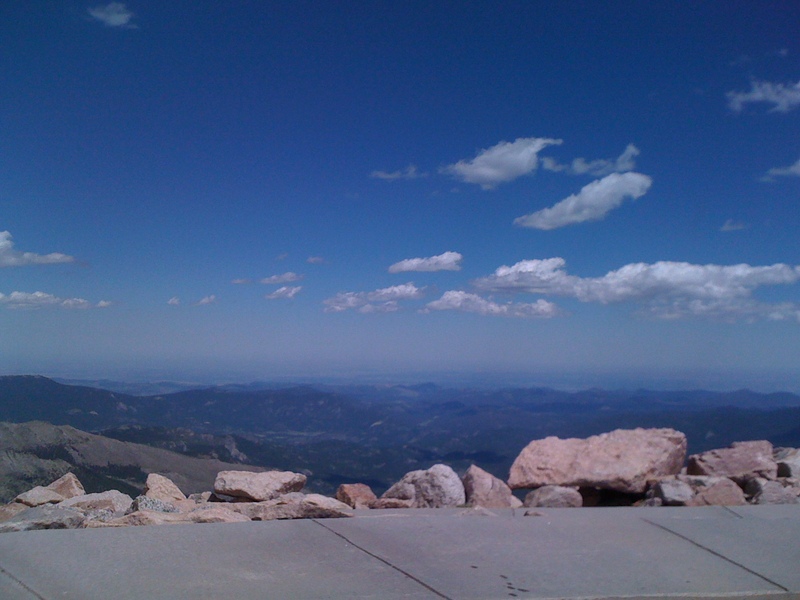 When I lived in Chapel Hill, we used to do day trips to ride up Mount Mitchell, Beech Mountain, and Snake Mountain… We did Bike Tour Colorado together in 2008. He would love Flagstaff! Or we could do repeats up NCAR! Or climb up to Jamestown! Or Ward! 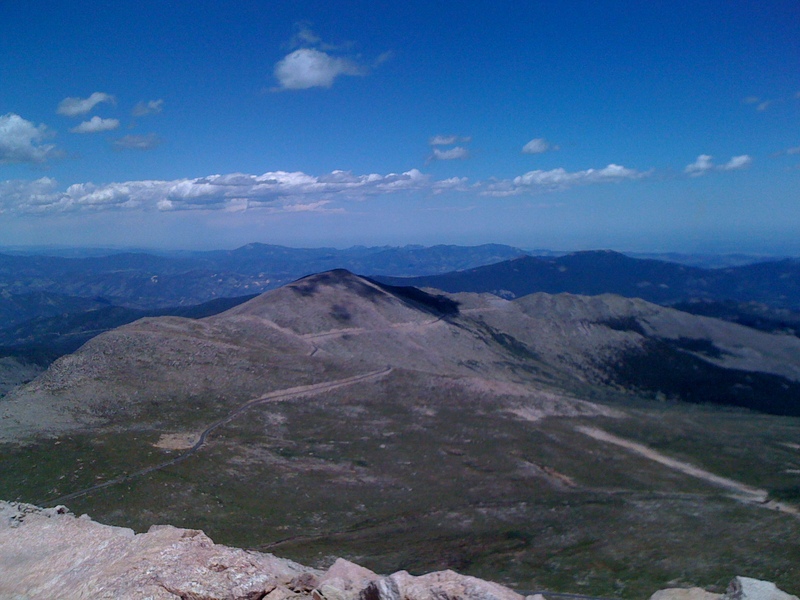 But then he emailed me and he was like “Maybe we could ride up Mount Evans one day?” And I was like “No way!” But it was already too late, the bug was in my ear… and after all I had finally acclimated to altitude. And the base of Mt. Evans was only an hour from my house. And Alan was coming all this way, and we have a tradition of doing ridonculous climbs together, it would be sacrilege to say I wouldn’t go… So I told him it would depend on the weather. Which was forecast to be pretty much perfect, so we had no choice but to go, which is what we did today. We had climbed Flagstaff yesterday so I wasn’t sure how my legs would fare but they held up ok. It was a very easy gradual climb from the middle school in Idaho Springs (which is where 103 meets I70) to about the 13th mile. There is a pretty stream going by on your left and there is even a trout farm, just like at Mt. Mitchell. These two climbs were actually very similar so far. 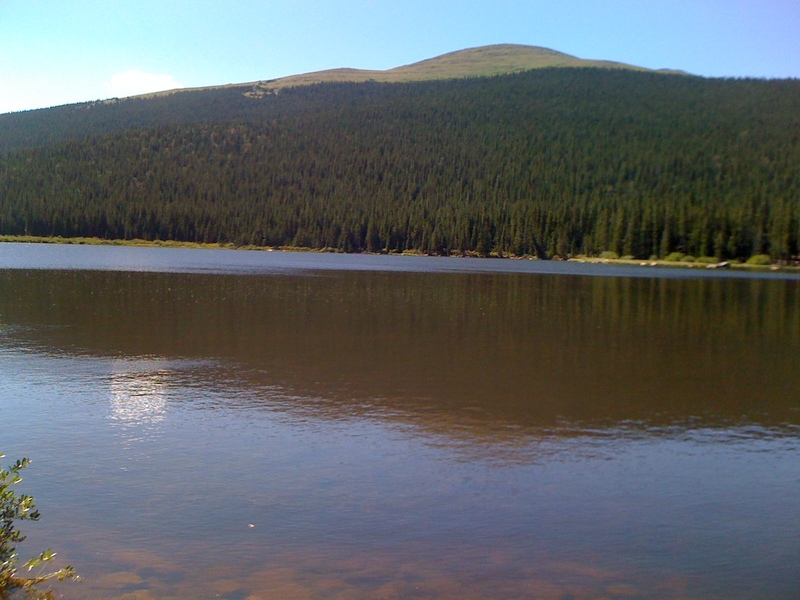 At about mile 13 you get to Echo Lake which is a crystal clear mountain fed lake. There are pit toilets at Echo Lake but no running water. Shortly thereafter is a little visitor center where I filled up my water. They also have homemade pies. Today there was coconut cream pie. I didn’t get any but I am making sure next time I do this climb I call ahead and make sure they have it because that is my favorite kind of pie and I am already looking forward to making a pie pit stop. (Dan happens to really love pie so maybe that will be part of my hook when I get him to do this with me). Also, this visitor center has a nice bathroom. Just after that is the toll station where you pay $3 to continue. I wish I had known I could have given them my national parks pass, because then it would have been free. I actually forgot money (believe it or not, ha ha) so I will have to be ESPECIALLY organized next time with the parks pass… Once you get up past the toll area, you have 14.5 miles left until you get to the summit and there are nicely marked on mile posts. This was good because the odometer on my road bike has needed a new battery for probably a year now. Everything was pretty smooth sailing until about the 3rd mile or so, when things got very exposed. And this is how I learned what “exposed” means. It means what you think it means. It’s awful. I don’t know how high we were at this point but it was HIGH. As in above the treeline. There were no more trees, no guardrails and plenty of strong crosswinds. There was a sharp dropoff to my right and cars coming intermittently on my left… Not the most fun. It got better after maybe a mile or two. It was still windy and exposed from there on but not nearly as scary. There was a little dip, the only respite we had till the top, for about 3/4 mile, then it was up, up, up some more, with one especially steep part which was maybe a 10% grade for about a quarter mile. That was the only part I would describe as especially steep. Then it went back to the way it was, gradual but not easy. We stopped for some animals who were crossing the road at one point. 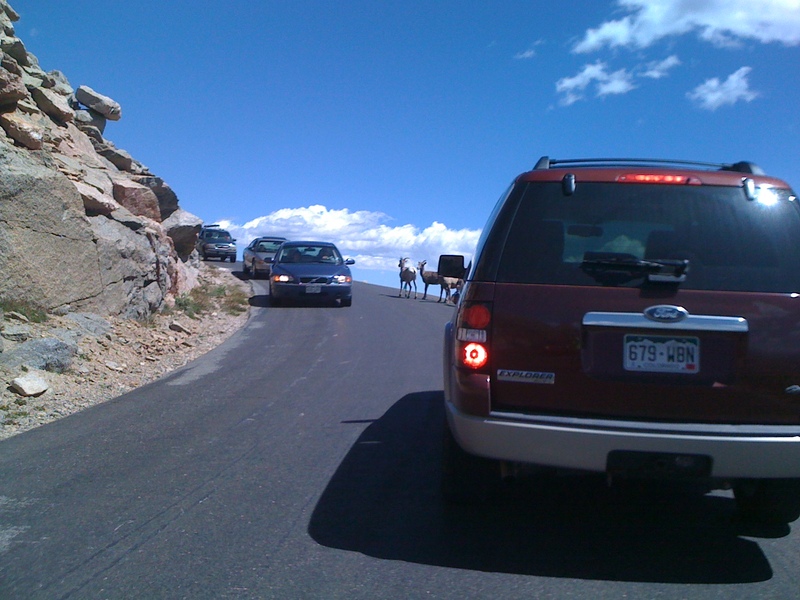 I think they were big horn sheep. Can you see them in the picture? I wasn’t trying to snap a shot of the SUV, I really was trying to capture the wildlife. I would say we spent 40 minutes of the elapsed time futzing around with leg warmers, peeing, eating, refilling water, etc. so total ride time to the top was about 4:40… By this time I had run out of gels and I was HUNGRY. Alas there were no vending machines at 14,000 feet. 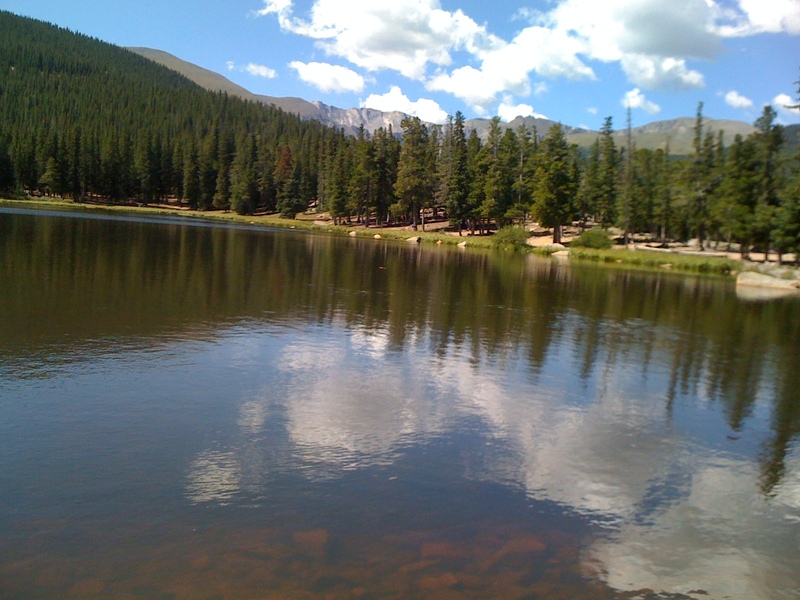 We enjoyed the view and headed down to the visitors center at Echo Lake. The descent was dicey as you had to be constantly focused but also relaxed, in order to be safe but not a Nervous Nelly. I did ok but I couldn’t do anything about the annoying seams in the road, which came about every 5 seconds or so. I hate those! We got to the visitor center within about 45 minutes (the miles go so fast when you are going down!) and I had the best chips and vanilla frapuccino OF MY LIFE. Oh boy was I glad I had on my Patagonia camisole, armwarmers, a smartwool top over my bike jersey, my vest, and my ear warmer headband for the descent. Even though we were getting lower and lower it was threatening rain and I was a little chilly. We booked it down from Echo Lake, where the grade is shallower and the turns are wider, making for a fun, thrilling (but not too thrilling) descent. Then we got back to town and we stopped at a Shell station where I ate the best burrito OF MY LIFE. (It was an egg, steak and cheese Santiago’s burrito. You can also get them at the Noa Noa coffee shop in Golden). What a day! 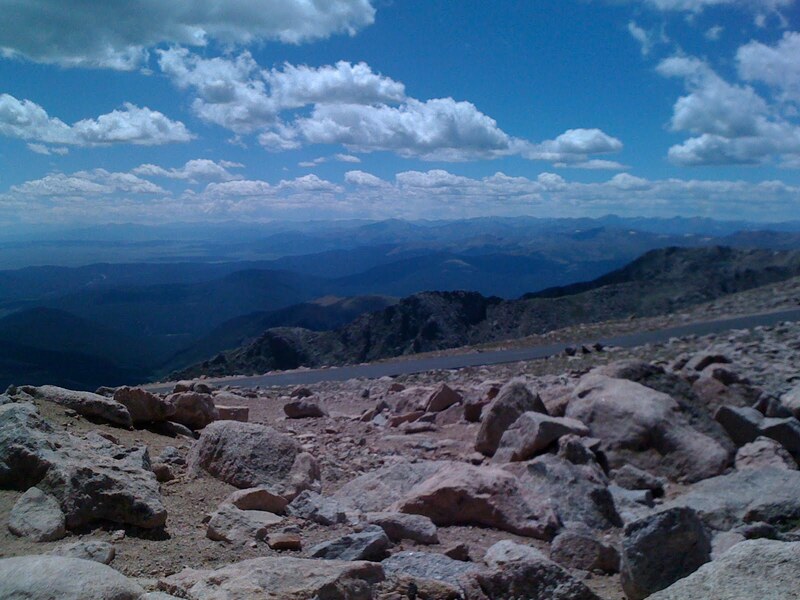 I would rate the climb somewhat more difficult than Mitchell mainly because of wind, exposure, and altitude. I felt fine but I think I was more short of breath than I normally would have been at that pace once we got within 5 miles or so of the top. I think if you have done some long climbs in the past and you feel fairly confident in your climbing ability and aren’t too nervous of a descender you would enjoy this and would have no problem getting to the top. This would NOT be a good one to do if you are not comfortable with that stuff. It’s just a little too dicey in some places to be safe or at all enjoyable for a beginner. As far as gearing, I did fine with a 34 on the front and a 12-25 cassette. Of course you always wish you had one more gear, but it really was ok.
Wendy sent me hear to read your report and I am just not sure I have it in me to do this ride. The climbing part would be okay, but the exposed road part would freak me out. Great job for you! !